I was taking the garbage out today and it was a misty morning. Some may have embraced the morning, some may have complained about a muggy morning and some may have not even noticed, lost in their thoughts and heading off to work. Fortunately, today I chose the first option and took note and enjoyed the morning as best I could (even with garbage in my hand). These are bare trees at the bottom of our garden and they featured on my Mar 06 post with the awesome clouds. I just love the different moods that nature provides, similar to us humans actually. I took this with my iPhone and the only edits I added where: Sepia tone and an Orton effect. 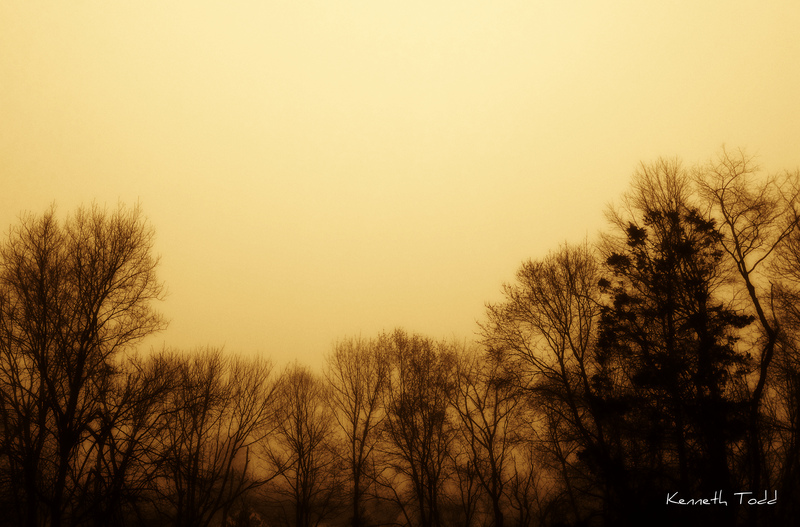 Than is essentially just adding a Gaussian blur as wanted branches soft to go with the soft misty look of the skies. I then added my signature. This Misty moody morning is apparently going to be a beautiful sunny and hot day (80F for March in Connecticut – Amazing!). So perhaps if your day has started off a little moody or muggy, maybe you can turn it into a beautiful sunny day for you. The beauty is that no matter what our circumstances, we can choose our thoughts. Let’s choose to be happy and appreciative. That’s great. Stay happy and thanks for visiting! This is kind of an eerie shot, but I think the warmer colors helps it. This might look cool with some cooler colors or black and white to give that old school horror look. Your picture is well done, and shouldn’t change! Ahh! Sun was shining here! Lovely shot. Thanks Cindy, appreciate the comments. This would make a beautiful card. Since we have sunshine about 300 days a year, I really like seeing landscapes like this. Gorgeous! So beautiul and reassuring for some reason. I definitely envy you ( and others) with iPhone and all its wonderful apps. Too bad it is not affordable for this old gal! I’ll keep on expanding my P’shop (TM) wonders though, and thank you so much for the like! Ex-squeeze me, please…THAT would be ‘beautiful’!